IS IT BECOMING A BIG KAHUNA? CURRENTLY - Current radar view at this hour shows moderate to heavy snow falling down towards Charlottesville VA and just north of Richmond. Snow will continue to move north over the next several hours, reaching the DC metro now through 7 AM and the Baltimore metro 8-9 AM. THROUGH THE MORNING - We expect snow rates to pick up quickly in all areas no later than 9 AM, and begin falling at a 1 inch per hour or more at times through 12 PM. If you have somewhere to be, we recommend getting there early to avoid what will look like a "wall of snow" moving over the area after 9 AM. SLEET & SNOW RATES - After 12 PM today, sleet should mix in with the snow, but just before that there may be an hour or more of high snowfall rates where heavy "banding" sets up on radar. Under these locations, you may see another 1-2" additional to what you received before Noon. BIG KAHUNA OR NOT? - To qualify for this unofficial label we assign to potentially big storms, it would have to produce 6 inches or more in a majority of locations where the snow is occurring. If the heavy banding depicted on short range models does develop, areas expecting 4" could easily end up with 6" or more. We think that remains a strong possibility between 10 AM and 2 PM. Bottom line: This has a good chance of going full Kahuna in some of our backyards, but not in all of them -- so when it does we want to celebrate! Let us know the moment you cross 6". WINTER STORM WARNING FOR MOST OF MARYLAND, VIRGINIA AND WEST VIRGINIA TONIGHT INTO WEDNESDAY FOR HEAVY SNOW, SLEET & FREEZING RAIN. WINTER WEATHER ADVISORY FOR SOUTHERN MARYLAND, SOUTHEAST VIRGINIA & LOWER EASTERN SHORE FOR 2-4" OF SNOW MIXED WITH SLEET & FREEZING RAIN. STORM MODE: For access to the latest official details on your local forecast for storm timing and precise accumulations, visit the links highlighted above specific to your region. TEAM SNOW MAP: Our regional snow & ice map is posted below with revisions if needed around 11 AM and 6 PM. SCENARIO SUMMARY: Our overview of the A,B,C scenarios from earlier posts will be consolidated into a summary statement with the snow map. The synopsis is we believe this event will encompass features of all three scenarios: Starting as a "Big Kahuna" with heavy snow the first 8-10 hours, then turning to an "Icecapade" for another 6-8 hours, and ending as a Cold, Curmudgeony Rain" into Thursday morning. into Wed AM, then changing to sleet & freezing rain by Wed PM. 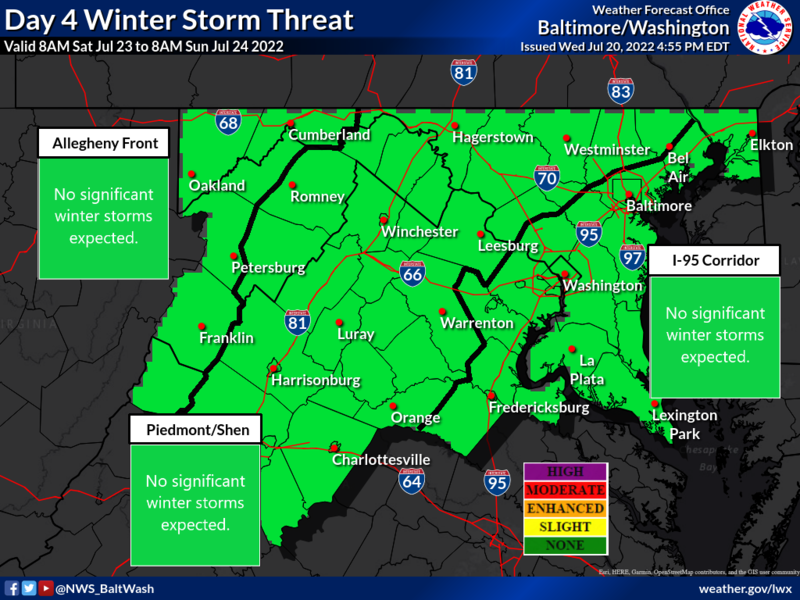 Below is our latest anaylsis and revised scenarios reposted from our central Maryland facebook update on Sunday evening. Check back during the day for additional information and updates. Approximately 1.0" of liquid or more is expected across the region from Tuesday night to Wednesday night. Some will be lost to evaporation in the first few hours of Tue evening, and another amount to sleet or freezing rain later on Wednesday. It is reasonable to expect at least 0.75" is convertible to snow for areas under a Winter Storm Watch. With temperatures around 30-32 F for most of the region during the event, a general 10:1 snow-to-liquid ratio can be expected until there is a change to sleet/freezing rain. The second image is NOAA's precipitation projection from Wednesday morning through Thursday morning. Excessive rain is lurking just to the south of the Mid-Atlantic with amounts of 2" and higher for just a 24 hour period. How to know if the forecast is on track? It's all about position of the High. We are closely watching for movement of the surface High in New England. If the center ends up moving back over SE Canada, the Mid-Atlantic may turn colder and receive higher snow amounts for longer. If the High shifts further east, expect a mix to move in sooner and cut down on snow totals. Slight revisions to the scenarios posted Sunday morning are shown below, accounting for potential movement of the High as noted in item #2. By this evening, as we approach issuance of any Winter Storm Warnings, our team will publish the Regional Snow Map in accordance with our "24 hours out" rule on snow projections. This projection produces an all-snow start across the region late Tuesday into early Wednesday, with accumulation prior to the Wed AM commute. A coating to 2" from Bowie, MD / eastern DC metro to Anne Arundel County and down to southern MD before a wintry mix works in by mid-morning. 4-6" for all other areas from there north and west to the 95 corridor and the I-70 corridor. Snow remains the primary precipitation typle through Noon Wednesday, with sleet mixing by the afternoon hours. Amounts exceeding 6" are possible in the higher elevations along western portions of the 70 corridor and near the PA line. Sleet & freezing rain would persist into early Thursday, changing to all rain area wide soon after the AM commute, but not soon enough to prevent significant ice problems on roadways. This projection takes into account the trend we have seen this winter, of storms "overperforming" with higher accumulations than forecasted for some areas, or warnings and advisories being extended due to a longer duration than first expected. 4-6" for areas south of I-70 to the 95 corridor, with mixing to develop by mid-afternoon Wed after bulk of heaviest snow has fallen. 2-4" for areas south and east of 95 to the Route 50 corridor, including DC metro, with mixing to develop by 12 PM. Coating - 2" from below Route 50 to southern Anne Arundel Co & Southern MD, with mixing by mid-morning. SCENARIO C (20% chance) for a Cold, Curmudgeony Rain. Snow area wide by the Wed AM commute turns to a mix along the 95 corridor by mid morning, then to rain, with all other areas turning to a rain/sleet mix by Noon. Due to copious warm air transport from the Atlantic, where water temperatures off the VA coast are in the low 50s, snow totals are held down to generally 2-3" for areas south of I-70, with up to 1" in the DC & Baltimore metros. Warm air at the mid-levels, combined with a southeast surface wind, erodes boundary layer cold air and mixing develops soon after sunrise. All turns to rain by Noon Wednesday into the evening, becoming heavy at times into Thursday. Additional information, weather decision graphics and our long-awaited regional snow map will be added later today, so please check back by lunchtime and this evening. 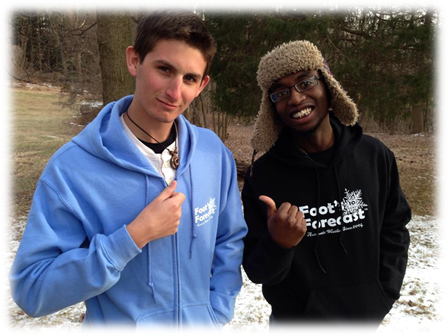 Greetings from the Foot's Forecast Team! We appreciate your interest in joining our vibrant and motivated multi-state organization of dedicated forecasters. Simply Google "Foot's Forecast and then click images. Take a look at what shows up, and consider the impact this experience of our team had on the all those people. To make your application efficient, follow the 5-step procedure outlined below. We suggest pasting our questions into a separate word document, and insert your responses below each. Title your application document “(First Name Last Name) – (Your State) – Application"
Length: Two pages is ideal, not more than 3 pages. First, tell us how you developed a passion for science, the outdoors, weather & forecasting. Next, describe in 1-2 paragraphs a weather event which impacted your life. A brief, specific list of skills, talents and innovative background you can offer our readership (abilities in media, videos, music, website, photography, sports, etc. An overview of your academic background, core courses and/or professional training if applicable. A brief list of activities you do outside of weather, and your favorite travel spots. Components: Today, Tonight, Tomorrow, Looking Ahead. 2-3 sentences each. 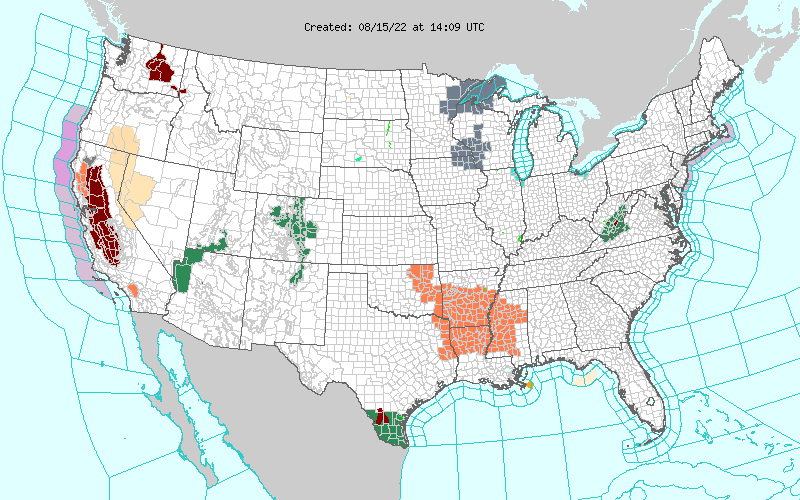 NWS advisories: If there is a significant weather event in progress in your area, please include a short note about the latest NWS advisory, a link to the text, and a link to the relevant NWS forecast office. Examples: In the Facebook search feature, enter "Foot's Forecast" and a variety of zones will appear. Select any zone in your region and follow the format shown. Review process: Your application will be reviewed by college students, high school lead forecasters, professional meteorologists and our advisory team. Our leadership will be seeking to evaluate if you can communicate actionable information to the general public during a complex weather situation with understandable language. How not to impress us? By trying to convey how advanced one in weather knowledge by loading up their statement with acronyms and technical terms. Talk to us in plain language and when necessary, illustrate a scientific concept with an analogy or real-life example. Have two references submit via email within two weeks of your application. If working from home or in the workforce: A member of your immediate family or a colleague who can speak to your passion for weather and forecasting. If between grades 9-12: Options include a parent or guardian AND a current/former science teacher of yours, another teacher in your school or a coach/administrator. Context of the letter is to know a professional with your school system is aware of your application and can vouch for your eligibility for our team. You can submit your application before your recommendation letters. Contact email and phone number for our team if we have questions. QUESTIONS? Before you apply, email any questions to Keith Krichinsky, our Chief of Continuity & Operations. If interested in further details, we can arrange for a conference call to speak with a Team Advisor and a Lead Forecaster. 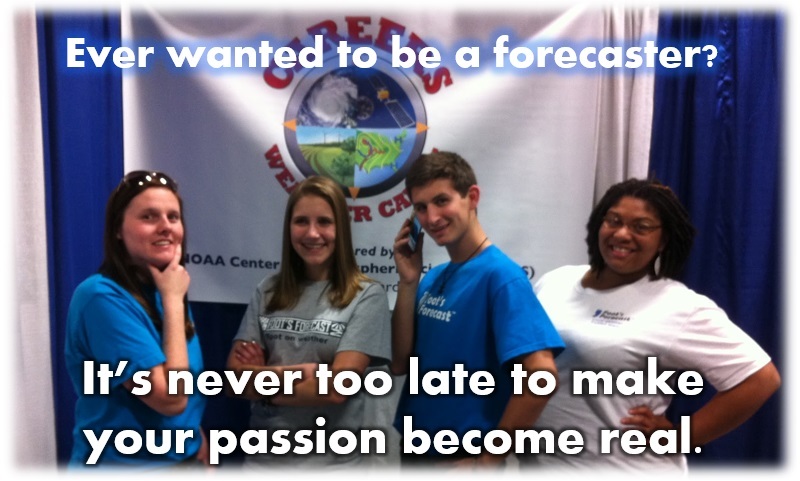 We look forward to reading about your passion for weather and forecasting! Here's a historical tidbit about the team & this picture. Taken at Penn State in March 2013, everyone you see here, all of whom started out as high school forecasters, are now actual degreed meteorologists working either in industry, on television or at a research institution. So when will that be your story? might also be their LAST day of the school year. considered by school districts caught in the calendar conundrum. Could this system be the season's first "Big Kahuna?" BELOW IS THE NOAA DAY 4 PROBABILITY MAP depicting the chance of frozen precipitation occuring in the shaded areas would exceed 0.25" of liquid equivalent. In the acacdemic study of statistics and probability, this high level 4 days in advance reflects confidence in the atmospheric dynamics required to produce this type of outcome. WHY IS THIS IMPORTANT? The extensive coverage of green shading, which represents a moderate 30-50% chance of the 0.25" liquid equivalent threshold, is the first time in the 2018-19 season such a strong probability has been posted for such a large portion of the densely populated Mid-Atlantic region. WHAT IS A "BIG KAHUNA"? First coined by FF writers and readers on this site in 2005, this term is assigned by our team to denote a widespread moderate to high impact winter storm affecting a large portion of the Mid-Atlantic (or other region), and produces 6-12" of snow. However, at 4 days out, uncertainty precludes us from determining this early it WILL be a Big Kahuna. Areas south & east of Columbia/I-95 which are more likely to transition to a wintry mix of sleet, freezing rain and rain. 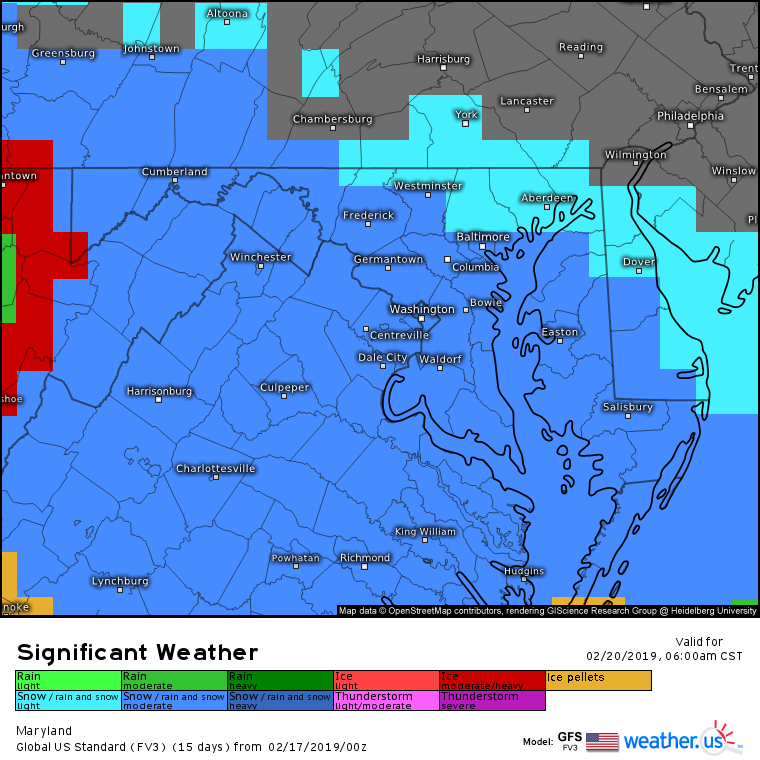 Despite probable Winter Storm Warnings posted throughout the region by the time Wednesday morning arrives, dry air and a slower onset of precipitation results in some schools & colleges deciding to open on time, observing that no snow is occuring at 5 AM. Soon after students arrive, heavy snow sweeps east to the 95 corridor by 8 AM. Another round of hastily announced early dismissals occur. This time, condition decline rapidly as snowfall rates quickly hit 1.0" an hour. The result is thousands of commuters and parents take hours to get home, harkening back to an era when less detailed technology made these kinds of situations commonplace. For areas north and west of I-95, north of I-70 into northern VA, central MD and the I-81 corridor into southern PA, snow continues unabated through 6 PM, with many areas exceeding 6", with higher amounts along the PA line. For areas south & east of 95, including much of the DC metro, mixing with sleet and freezing rain develops by mid morning, turning the PM commute into a complete icy lockout disaster. By Thursday morning, overnight runoff and refreezing has created another ice nightmore, although all precip is turning to rain around sunrise. 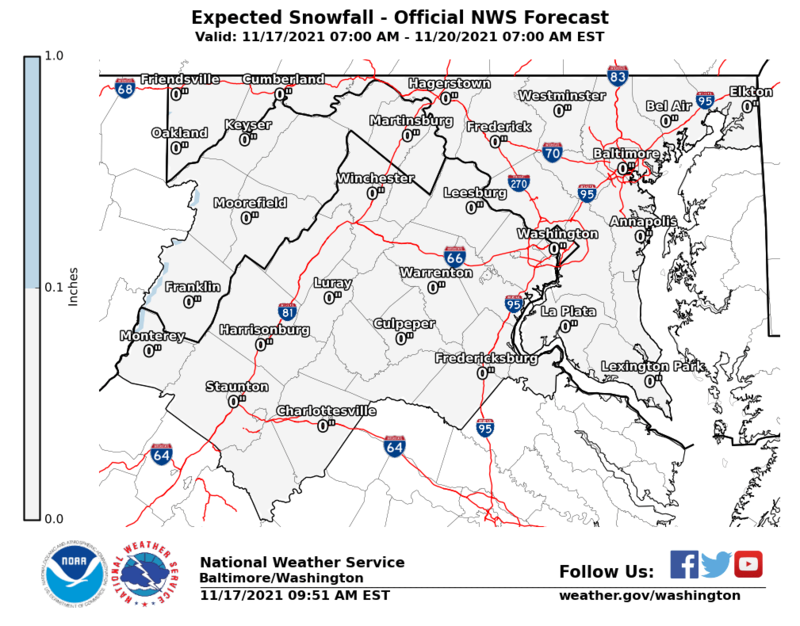 Light to moderate snow develops in the early morning hours of Wednesday, with at least 1.0" on the ground in all locations north of the I-66 corridor in Washington, DC. Many schools and colleges elect to close outright instead of a 2-hour delay with re-evaluation, as it is clear conditions will worsen through the day. Colder than expected surface and upper level temperatures permit snow to persist longer than forecasted, and over a larger area. A change to sleet & freezing rain is delayed until late afternoon for areas east of 95, and never occurs for areas north of I-70 to the PA line & southern PA. Winter Storm Warnings are extended into early Thursday for heavy snow in the north, and up to 0.30" ice along from I-70 south to I-95 and east to I-97. By Wednesday evening, snowfall totals approach 12" for areas north of I-70 and along I-81. In northern Maryland, some parts of the "the North 4" of Frederick, Carroll, Baltimore & Harford counties exceed 12" in areas bordering the PA line, and it is still snowing by nightfall. Cecil County is vying for recognition with a respectable 8-10" of snow. Areas from I-70 to 95 are seeing a sleet/freezing rain mix producing a glaze on top of 4-6" of snow, and from DC to southern Maryland precip is turning to rain by Noon after 3-4" of snow. Below: NOAA Global Forecast System (GFS) model for 7 AM Wednesday. Position of the High pressure in Canada. An old forecasting rule proven correct time and again is simply this: Predict the High and you predict the storm. If the High in SE Canada positions where shown by Wednesday morning, Scenario B has a high chance of succeeding. If the High in upstate NY/SE Canada pulls east earlier than expected, the other Low pressure features will convert this setup into a snow-to ice-to rain outcome similar to what has occured twice in the past 2 weeks. And now, let the speculation games begin! Which scenario are you siding with? Are you prepared for the consequences of that? We shall see and time will tell. DOES A BIGGER BEAST AWAIT... at winter's endgame? Does a bigger beast await...at Winter's endgame ? An increasingly active weather pattern indicates the Mid-Atlantic and Eastern U.S. may be entering a high impact period of multiple winter weather events over the next 2-3 weeks to straight to March 1. The current pattern of "rain, cold, snow, ice, back to rain" is evidence that a resurgent El Nino in the Pacific is persistently delivering high moisture systems into the jet stream flow - which upon reaching the East coast, interact over several days with strong High pressure positioned nearby. The rising frequency of this repeating pattern, in a climatologically favored time of year for winter weather events, raises the probability that at some point soon -- deep Pacific moisture will collide with a stubborn-as-rock Arctic High, and the result will be a major to high impact coastal & inland "Big Kahuna" storm. Could it be an event that rivals the storied powder-producers of yesteryear? Why yes, it certaintly could. 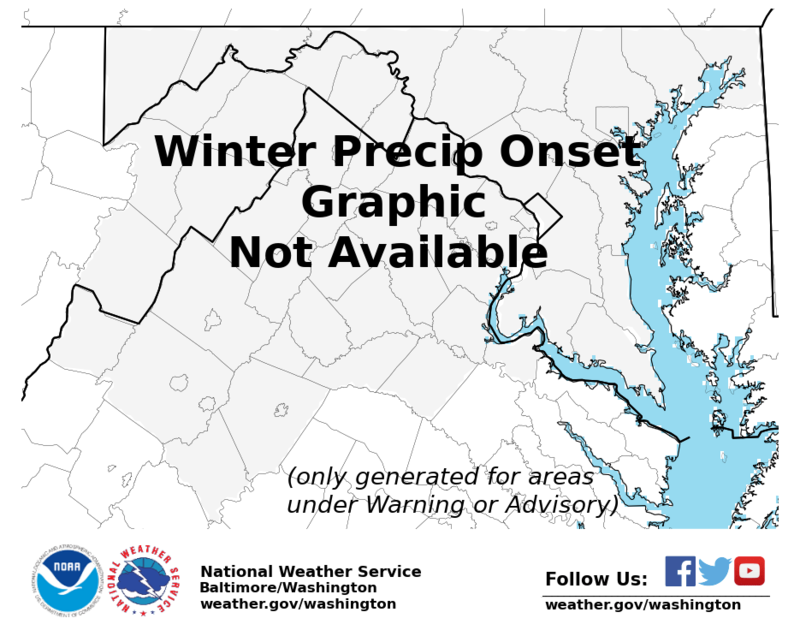 The NOAA Weather Prediction Center in College Park, MD already has progged a notable probability of frozen precipitation in the Day 5,6 and 7 periods. This map is for next Monday into Tuesday. This is the first time all season these probability maps have shown a 10-30% chance of precipitation falling as a frozen substance up to at least 0.25" of liquid equivalent -- for 3 days in a row - and covering a large portion of the East. Put a more simpler way for us regular scratch-and-dent people, in a 10:1 snow to liquid ratio, this map is roughly equivalent to 2.5 - 4.0 inches of snow. That may not seem like much, but is a good indication that probabilities for accumulating snow over a large area are already notably high this early. What are NWS local offices saying? 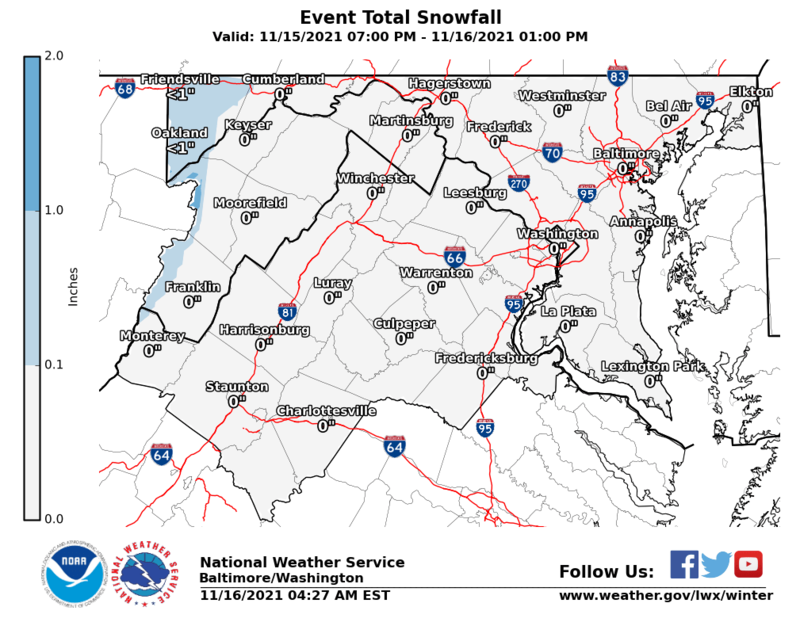 Sterling VA NWS: "Guidance has shifted notably in the long term to a potentially colder and snowier solution, but uncertainty remains significant." Wakefield VA NWS: "The lack of consensus within individual model runs and between the global models results in considerable uncertainty in the long term. We have at least the potential for some precipitation type issues this weekend, into early next week." Philadelphia/Mt. Holly NJ NWS: "A very active weather pattern will persist through this period with several problematic shortwaves moving through a broad long wave trough over North America potentially impacting the area with more wintery weather." Whatever happens from here forward, the makers of Dos Equis would be proud, because the next 7 days are certainly going to rank among the most interesting weather patterns in the world for a time. Will Wednesday be back to normal? Enclosed image are the areas affected as listed here, and the radar as of 1:00 PM. 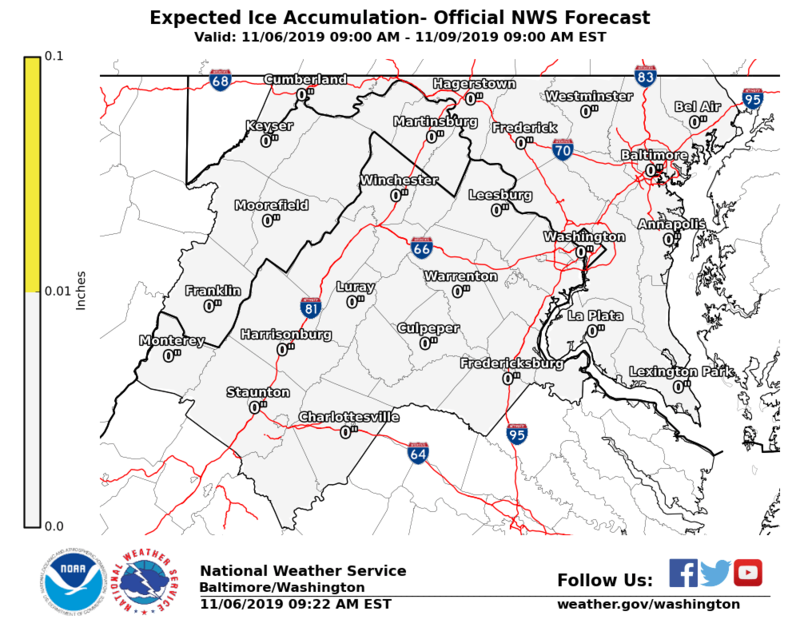 ICE CONTINUING An additional 0.10" of ice due to freezing rain is expected in these areas, in addition to rising risk of power outages due to ice accretion on trees and power lines. Winds of 20-25 mph will also create increasing hazards of falling ice, branches and limbs. WEDNESDAY? IT DEPENDS. Issues with power outages, potential refreezing of snowmelt runoff onto parking lots, the fact that rain will have washed off any road treaatment, and the possibility that temps may dip just below freezing for a short time early Wed AM-- all point to the AM commute tomorrow still likely to be somewhat challenging and/or hazardous in some locations where the Warning is in effect. STAY INDOORS IF YOU CAN We urge all readers to please take EXTRA precautions if you are venturing out and be VERY AWARE of any trees, branches, lines above you. The best plan is to stay indoors. Every year when this kind of freezing rain happens, after many people think it is over-- someone takes their pet for a short walk under trees and branches. It has often ended with a very sad, very tragic result. We wish to do all we can for that to be prevented! If you are not sure the trees are icy or just wet-- they probably have ice - so please do what you can to not put yourself or anyone, especially children or the elderly, at risk. Thank you for taking our concerns into consideration. Monday into Tuesday: More Ice Issues. TONIGHT: As indicated on regional radar, near-surface temperatures for areas north of I-70 appear reluctant to move beyond 32 F. This may be influenced by the chilled surface now that snow & ice cover has trimmed a few degrees off earlier forecasts. After 6 PM, we expect areas that are currently snow may continue as such, with areas in a freezing rain or sleet environment may see rates increase. EARLY TUESDAY AM: Unless there is a last-minute wind shift from east to south, ushering a calendar-saving southerly pulse of milder air, we do not foresee any notable warming that converts all the snow / ice over to rain region-wide until at least late morning Tuesday. 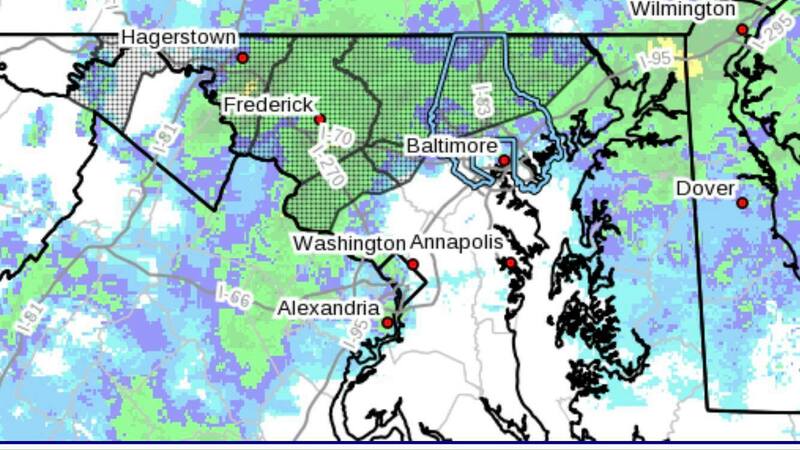 Areas south of Route 100 in Howard County to the DC metro would see mostly rain overnight. For areas north of Route 100 & Montgomery Co. MD north to I-70, this regime of frozen precip is likely to continue to daybreak. TEMPERATURES vs. ICE: The nature of freezing rain, being a "latent release of heat" process, tends to reinforce the boundary layer conditions to remain in a steady-state environment, until there is a significant area-wide movement of warmer air. One a glaze builds up, it does not automatically begin dislodging or full scale melting even at 32 F or 33 F. This is due to the surface under the ice now somewhat cut off from the atmospheric temperature. Simple right? The ground UNDER the ice is colder, and so it tends to keep the surface right near 32 F for an extended time, even if air temps are 34 F.
HOW TO WIN THIS BATTLE? The only way you beat this is with time. Unless you are going to personally oversee 3 more full scale state wide salt applications so that we can get every road surface at 35 F or higher by 6 AM Tuesday. Otherwise, for areas with freezing rain, this will hold temps back from rising much above 32 F until (sigh), at least 9-10 AM Tuesday. If your area switches over to plain rain at 34-35 F, you've won and the ice will lose much more quickly. For areas receiving freezing rain: Once a glaze begins, this requires a noticeable movement in air temperature well above 32 degrees to begin affecting the glaze. INCREASING VEHICLE CRASHES? If your area is experiencing increased crashes, it is in part due to the previous salt application having lost its effectiveness after the first 90 mins of precipitation. Then road surface temps start to decrease if frozen precipitation is on-going as the treatment gets further diluted. GROUND VS. AIR TEMPS: A covering of ice isolates the ground from air temp changes for some time, delaying how long it takes for improvement to develop. For areas along & north of I-70 & east to 95, temperatures not expected to break 32 until after 10 AM today. WINTER STORM WATCH: Areas of northern MD into southern PA are also under a Winter Storm Watch, which is expected to be converted to a Warning prior to 4 PM. This indicates conditions begin deteriorating again as the PM commute gets underway, the same time elementary schools are dismissing in the 3-4 PM hour. 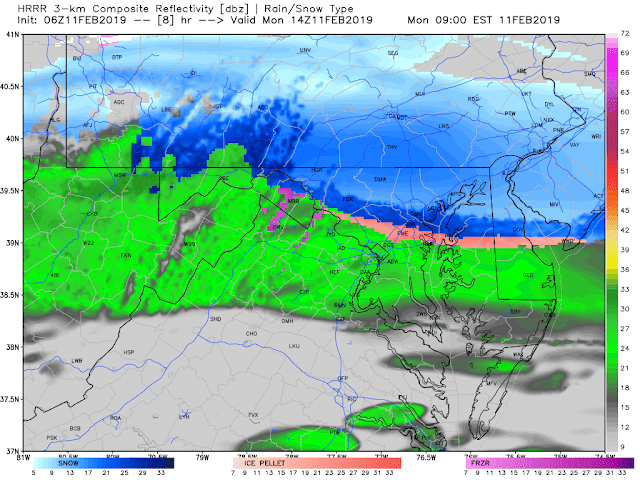 SHORT RANGE SIMULATED RADAR: Indications are a majority of northern MD counties will remain in an all-snow or all-snow/sleet mix through at least 9 AM today. With ice along the Route 32 corridor and rain further south to DC metro. WINTER STORM WATCHES have been posted for northern Maryland into much of central & southern PA for Monday afternoon into Tuesday. Winter Weather Advisories are in effect through 10 AM or 12 PM Monday depending on your location: Baltimore/Washington NWS area | Philadelphia NWS area. WHAT IT MEANS? Resurgent cold air will be transported along east side of the Appalachians starting Monday early afternoon - and interact with a westward moving pulse of moist air from the Atlantic. HOW MUCH IS EXPECTED? In addition to the 1-2" of snow/sleet and freezing rain expected overnight into Monday mid-morning, this second system to develop on heels of the first may produce a "mini-Kahuna" of heavy snow. Developing from 4 PM to 10 PM Monday, totals in areas under the Watch may exceed 6" in places, in just a few hours. These will be areas where limited changeover of sleet or freezing rain occurs, especially along and north of I-70 in MD up to the 76 PA Turnpike corridor. WHAT WILL SCHOOLS DO? Since Mother Nature is going to do her part to produce "ground truth" in the form of snow, sleet and freezing rain throughout Monday and into Tuesday, we expect many districts in Maryland, Pennsylvania and northern Virginia may close outright first thing in the morning. Opening on a 2-hour delay would be a significant logistical challenge in addition to hurtling head first into what will by then be a Winter Storm Warning to take effect at 4 PM same day. WHEN IS THE SNOW COMING? See below for onset time. Bottom of the post are details on the outcome for Tuesday. FOR AREAS IN THE WINTER STORM WATCH, we selected Frederick, MD as the representative location for how conditions will play out Monday into Tuesday. A bit complicated is it not? Facing a big decision that affects lots of people? If your company or organization needs more direct winter weather intelligence & advising, considering letting us help you work the storms together: contact the FF team at this email for more information. Is it snow, slush, sleet or something else? on the road when temperatures and precip type are changing rapidly. PROBABILITY? High confidence of 80% that a widespread winter storm of moderate impact will affect most of the Mid-Atlantic from Sunday night into Wednesday morning. PRECIPITATION? 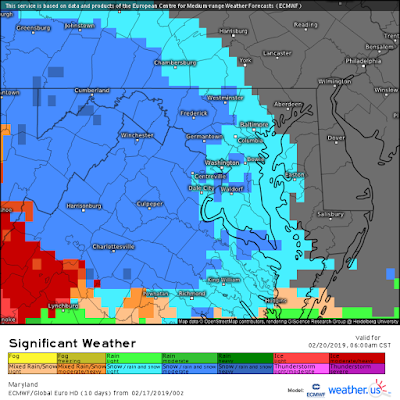 Multiple precipitation types starting with snow on Sunday night, transitioning to sleet, freezing rain, then rain - and eventually back to frozen again are expected. The cause will be temperature pattern that holds near 30 F in overnight hours, producing wintry conditions, followed by a few hours of just above 32 F at times, allowing for a change to rain in areas south of I-70. TRAVEL? Much MD west of the Chesapeake Bay, Virginia and Pennsylvania is likely to have disruption to travel for the AM commute all three days (Mon-Tue-Wed), with lesser impacts possible for PM commutes. ADVISORY OR WARNING? 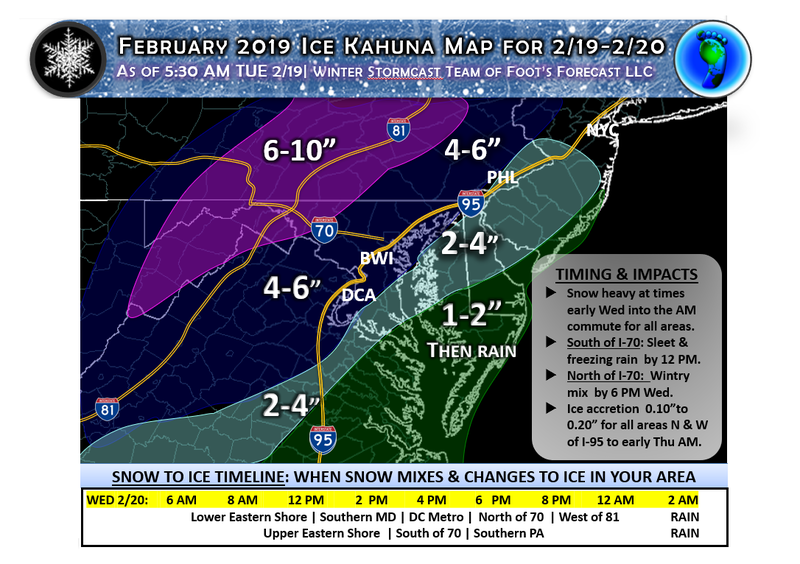 Highly probable the NWS will be issuing multiple winter weather statements over a four-day period for a large area from the 95 corridor / DC metro / Northern VA to Baltimore, Philadelphia, New York and interior sections. Some areas may start with Advisories and could be upgraded to Warnings depending on intensity and type of precipitation. Will there be a big storm this year? The current weather pattern indicates one major winter precipitation event for the Mid-Atlantic remains likely in the period February 15 to March 1. Our rationale is that the high moisture content of multiple systems seen already this winter, and the probability of one or more significant cold waves to envelop the nation later this month. Copyright (C) 2004-2019 Foot's Forecast LLC (TM) All rights reserved media.admin@footsforecast.org. Theme images by merrymoonmary. Powered by Blogger.